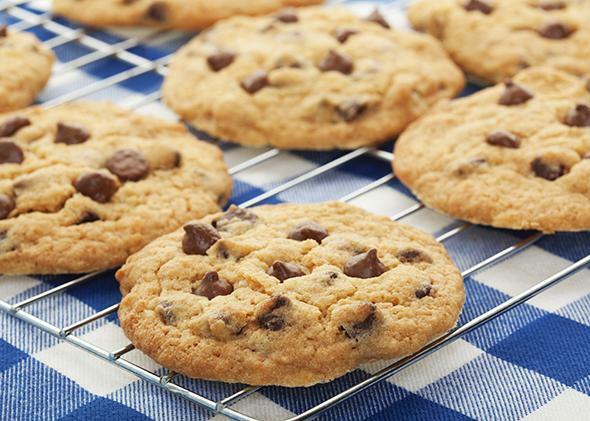 Who invented the chocolate chip cookie? Ruth Wakefield—and no, it wasn’t an accident. She was a gifted cook and a savvy entrepreneur. And, despite what you may have heard, she didn’t invent it by accident. It’s hard to imagine these never existing. Julia Child and James Beard have nearly as much name recognition to many Americans as the Founding Fathers. But when was the last time you ate one of their dishes? I’m betting it’s a lot longer ago than your last chocolate chip cookie. And yet, probably not one in 20 Americans know the name of the chef who invented America’s favorite cookie, if they even realize they were invented. Chocolate chip cookies are so ubiquitous and taken for granted that many people assume they’ve been around as long as apple pie and ice cream and have equally ancient, anonymous origins. These cookies were actually dreamed up within the lifetime of many living sugar addicts by a visionary named Ruth Wakefield, and it’s about time we paid homage. She was a Depression-era owner of the Toll House restaurant in Whitman, Mass., who decided in 1938 to up the appeal of some butterscotch cookies she had been serving alongside dishes of ice cream with some cut-up pieces of chocolate bar. And thus an American dessert icon was born. In short, Wakefield’s contribution to the national sweet tooth is monumental. So why have so few people ever heard of her? In short, this is not the kind of place where things happened by accident. And yet if you have heard anything about Ruth Wakefield before, it’s probably that she invented the chocolate chip cookie in a panic or a pinch, deciding to substitute pieces of chocolate cut up from a bittersweet candy bar she had on hand when she ran out of nuts for a cookie she served at her restaurant. Or you may even have heard that Wakefield spilled chocolate morsels into her cookie dough unintentionally, after a nearby mixer started running amok. Versions of these stories are all over the Internet and also in almost every other article or book written about the chocolate chip cookie, along with the equally bogus corollary that Wakefield expected the nut-sized nuggets of chocolate to melt into the cookies’ crumb and was surprised when they stayed intact. But every part of this tale is utterly specious. Not only was Wakefield highly organized, she also had a college degree in household arts—in other words, she understood how chocolate and cookie dough behaved when heated. And she gave several (admittedly hard to find) newspaper interviews and one speech about how she invented the cookie on purpose. “We had been serving a thin butterscotch nut cookie with ice cream. Everybody seemed to love it, but I was trying to give them something different,” Wakefield told the Boston Herald-American in 1974. Like any smart restaurateur, Wakefield was always looking for ideas to improve her business. I think the persistence of the “dumb luck” story says less about her than it does about us, specifically about pervasive sexist attitudes. That Ruth Wakefield invented the chocolate chip cookie by dint of training, talent, and hard work may not appeal to people who like their women quiet, passive, and unassuming. But people who knew Wakefield know she was a gifted cook and a shrewd entrepreneur—the furthest thing from a shrinking violet. Even her decision to give her cookie recipe away for free—first just to restaurant patrons, and then to Nestlé for use on their chocolate bars’ and chips’ packaging—was a sign of her business acumen. Recipes cannot be copyrighted, and by inking her deal with Nestlé 75 years ago this week, Wakefield was engaging in cross-promotional marketing decades before that phrase was even invented. Ads for Nestlé’s Semi-Sweet Chocolate Bar and, later, their Semi-Sweet Morsels referenced the recipe source as “the famous Toll House Inn at Whitman, Massachusetts” and “Mrs. Ruth Wakefield’s Cook Book Toll House Tried and True Recipes, on sale at all bookstores.” Wakefield’s cookbook became a best-seller, in large part because of this national publicity. So there is no need to cry for Ruth Wakefield. Between her restaurant and her cookbook, she was as close to a cooking celebrity as America had in those days, known to and visited by virtually every celebrity who passed through Greater Boston from the ’30s through the ’60s, including culinary ones like Duncan Hines, Howard Johnson, and Julia Child. But Wakefield’s renown was tied to her restaurant, which did not maintain her standards under subsequent owners after her retirement, and then burned to the ground at the dawn of New Year’s Day 1985. By then, her most famous culinary offspring already had a well-established life apart from Wakefield and the Toll House restaurant. But just because people take chocolate chip cookies for granted doesn’t mean they should. The next time you have one, please raise your glass of milk to the strong, smart woman who invented them.